Today Microsoft released an update to Microsoft Office 2016 for Mac Preview. Version 15.11.1 is the second update for the month. Here’s the details. Today I was a bit surprised to find a new update for Microsoft’s Office 2016 for Mac Preview 15.11.1 (KB3074179) available for download. It was just a few weeks ago that Microsoft released KB3048692, ending its trend of updating its new Office Suite just once a month. The Office 2016 for Mac Preview – June 23, 2015 update provides bug fixes for the Microsoft Office 2016 for Mac Suite (Word, Excel, PowerPoint, and Outlook). 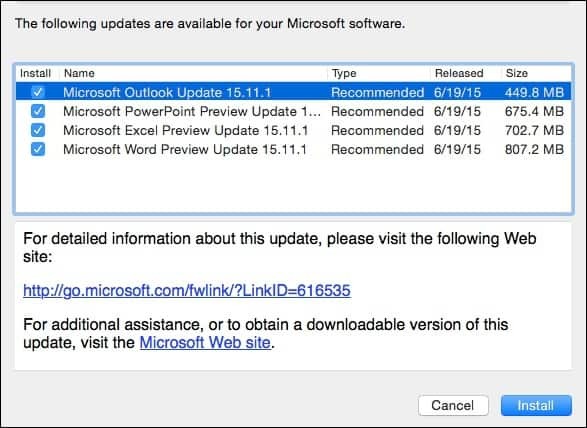 To install the update, I recommend just launching Microsoft AutoUpdate for Mac as it will detect and install the update packages for Outlook, Powerpoint, Word and Excel. For those of your who prefer to package and deploy the update to your internal users via Casper or some other packaging technology, the KB article contains links to the updated .pkg files for each Office app. I suspect that this update–at least for Word to 15.11.1–was spurred because of continuous crashing under 15.11. It crashed when opening a document, when saving, when typing…. Sporadic and entirely counter-productive. Hopefully, this update will fix that! Love the blog–thanks! I’ve been having so many issues with scrolling and mouse movement in Mac Preview, I hope it fixes those issues. The last update (KB3048692) fixed the continuous crashing that would happen every time I would open/use/save Excel files. I’ve been having countless issues with 15.11 and 15.11.1 that it’s almost unusable. Outlook is especially buggy – crashing at least 15 times a day. Attempting to open and reply to emails often causes the app to hang, the ribbon often disappears, the folder navigation pane has a block colour in front of it, general freezing etc. Very disappointing.